Scarce summer visitor but probably under-recorded due to misidentification. No confirmed breeding records. The plumage of this species is highly variable, and shows only slight differences between sexes. Generally the adults have a pale grey head (females may be browner) and the upperparts are generally uniform in colour, varying from creamy pale to light brown to rufous to dark brown to black. The underparts are pale with a variable amount of dark spotting, streaking, barring or a combination of these. Distinguished in flight from Common Buzzard by a small ‘pigeon-like’ head and a longer tail. A highly secretive bird that nests in lowland deciduous or mixed forest. A specialist insectivore that feeds mostly on the larvae and pupae of wasps, hornets and bumblebees. Also eats other insects and occasionally small mammals and reptiles. Arrives from Africa in May and leaves again in August or September. 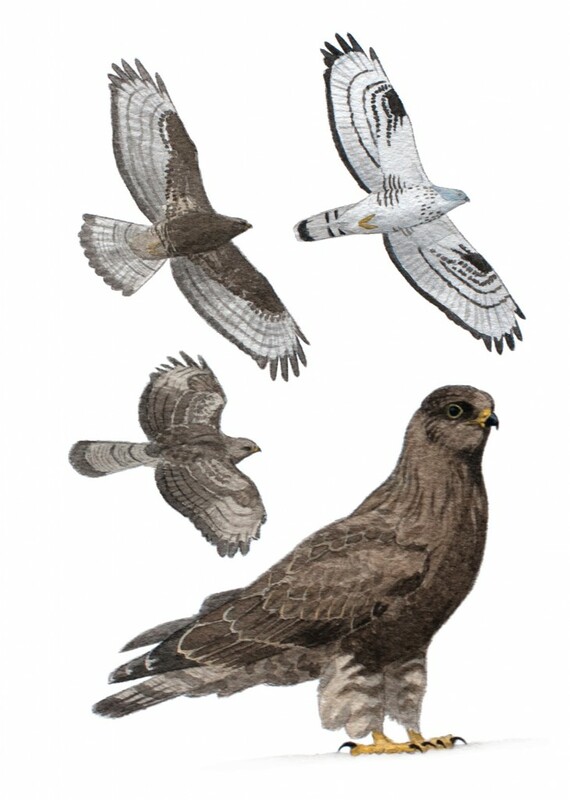 Copyright © 2019 Northern Ireland Raptor Study Group. All Rights Reserved.